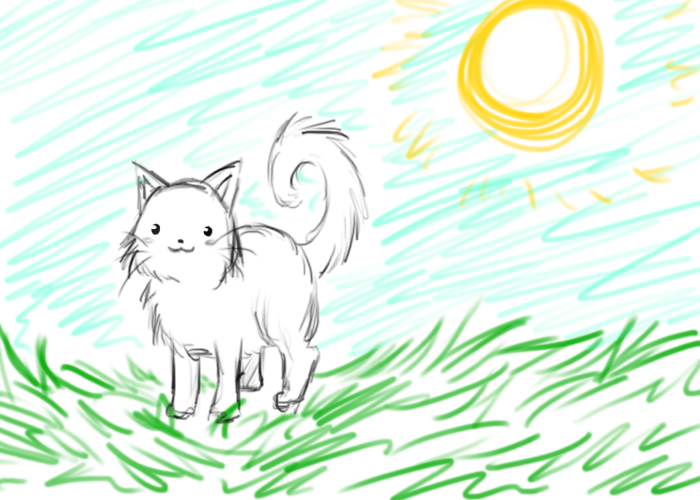 Today is a very sunny day and Daisy the kitty wants to go play outside in the garden! The door to the garden is open, so Daisy steps outside into the sun. First, Daisy takes a sprint to the opposite side of the garden. She’s fast! ,,Hi Daisy! Nice day today!” replies miss Blossom. ,,Good morning Daisy! What a lovely day it is, isn’t it?” replies miss Peep. ,,Good day, Daisy! I’m expecting today to be a productive day for me.” replies Mary. Miss Blossom, miss Peep and miss Mary have been living in this garden for over 3 years now. Every day, they provide Daisy’s caretakers with fresh eggs. Daisy jumps off of the hen house and dives into the tool shed. It’s dark in here! She walks into the door opening of the tool shed and takes a look at the garden. Suddenly, Daisy spots something flying around the garden. Time to chase it! She takes a leap into the garden, towards the unidentified flying thing, which is flying nearby the rose bushes. What could it be? The unidentified flying thing is purple with blue. Daisy is curious and comes closer. The unidentified flying thing lands on one of the many red roses on the rose bush and looks at Daisy. Daisy turns her head to the side. ,,A butterfly? You are pretty! I haven’t seen you around,” she says. ,,Oh, but I have been here for weeks! Before I became a butterfly, I was a caterpillar,” the butterfly explains. ,,How does that happen?” asks Daisy. ,,It sure is! I’m going to enjoy the sun for a bit right here on this rose,” says the butterfly. Daisy turns around and jumps onto one of the lawn chairs. The one with a pillow on it is her favorite. She lies down on it and will soon doze off, smiling, because she knows she has made a new friend today.